I wanted, at long last, to let the kids speak for themselves, even if sometimes it was a little messy. Because I knew the truth. Yes, love makes a family, but also sometimes arguing with your moms makes a family. And I knew that we — the glorious and diverse array of queer families across this country — were more interesting, complicated and real than we’d been given credit for. I wanted us, and in particular queerspawn, to be able to just be real families instead of special families. To be clear, I have met many fabulous, glittery, rainbow queerspawn and their parents in my time, so I’m not disputing that we’re pretty freakin’ awesome — I just dreamed of a day when we didn’t have to be awesome to be accepted. As a queerspawn who had found such a sense of community through COLAGE (including delighting in the in-your-face-ness of the word “queerspawn”), I wanted Our House to provide camaraderie and connection for any kids in the audience who needed it. I kept in mind how I would have felt as a “closeted” eleven-year-old queerspawn had I turned on the television and seen other kids with gay or lesbian parents. (Seriously, that would have blown my mind.) And, on a political level, I also wanted a national audience to hear from the kids, so that people would understand that our families are real and deserve respect, not only socially but legally as well. During the research phase of Our House, COLAGE staff (and queerspawn extraordinaire Stefan Lynch, who coined that term) were instrumental in connecting me to kids all over the country who might participate. I talked to many kids on the phone, met dozens of others in person, and heard stories of pride, fear, fatigue at the feeling of being under a microscope at times, resentment at their families being considered less than, plus all the other kinds of funny, thoughtful, wacky things you hear when you take the time to listen to young people. It was hard to narrow down this large group, but we ended up selecting five families that I hoped represented the diversity of our community, not only racially and ethnically, but in our religious backgrounds, socioeconomic statuses, geographic locations and family structures too. I remain so deeply grateful to the families who trusted my crew and me to tell their stories. 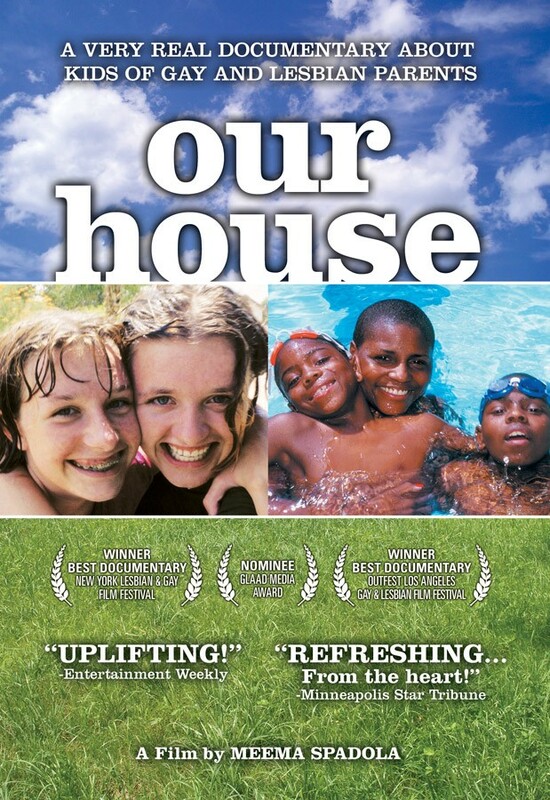 The summer that Our House screened on television, I traveled around the country doing community screenings, talking to so many families and kids in places as varied as Durham, NC; Las Vegas; Boise, ID; St. Louis, MO; and also the small town I’d grown up in in Maine. The best feeling was seeing kids’ excitement at spotting some piece of their life or a thought they’d had, right there on the screen. Fast forward 18 years after Our House first aired on public television. I’m gearing up for the first public screening in a long time, where Our House will be shown to an audience in Brooklyn, and I will participate in a Q&A after, along with one of the families from the film. How will Our House be received now? Will it feel hopelessly outdated? How will I feel watching it again in front of a crowd? So much has changed, socially and legally. We have marriage equality nationwide, and we had (at least under President Obama) recognition of our families by a sitting president. There’s a greater presence of our families in mainstream media, and there are so many more public figures who are out about their families. As for me, I’m married, I have a fabulous 10-year-old son (who counts among his friends and schoolmates plenty of queerspawn and never takes for granted that a family is headed by a mother and father), and I don’t make documentaries anymore. (Now, as a postpartum doula and lactation counselor, I premise my practice on the assumption that each family’s situation is unique, and work hard to be a resource for LGBTQ+ families.) And last but not least, all the kids in Our House have grown up and many of them are parents themselves now! When I raised the issue with the school’s administration, I talked about sensitivity to students with LGBTQ+ parents, and also to children with a single parent, a parent who has died, or children being raised by someone other than a parent. They were open to listening and responded positively and quickly. All our school forms now ask for “parent/guardian” contact info. Teachers and staff are working on being more sensitive, inclusive and positive about all types of families in classroom activities and assignments and with how they interact with families. We’re making progress. So, yeah, Ry, I’m also still waiting for that day. But I’m proud of the part that outspoken queerspawn (and yes, Our House) have played in getting closer to that day. Our House will be shown at a free screening in Brooklyn, NY on Thursday April 12 at 6:30pm as a part of Her-story: A Film Series From a Women’s Perspective hosted by First Unitarian Congregational Society in Brooklyn Heights at 48 Monroe Place (Corner of Monroe and Pierrepont). Meema will be participating in a Q&A after the screening, along with some of the members of the NYC family featured in the film. For those who can’t attend the screening, Our House is also available to stream on Amazon. Meema Spadola is a former documentary filmmaker whose work has been broadcast on PBS, HBO and beyond; her short radio pieces can be heard on This American Life; and her autobiographical essay was included in the anthology Out of the Ordinary: Growing Up with Gay, Lesbian and Transgender Parents. She grew up in rural Maine, and her mother came out as a lesbian after her parents separated when she was ten. Meema is now a postpartum doula and lactation counselor living with her family in Brooklyn, NY. Meema Spadola is a former documentary filmmaker whose work has been broadcast on PBS, HBO and public radio. She is now a postpartum doula living in Brooklyn.